All kinds of wireless networks—those used by wireless operators, fixed wireless networks, enterprises and the ever-growing Internet of things, for example—are always in need of more spectrum. The recently-available Citizens Broadband Radio Service (CBRS) opens up that precious new spectrum—if you have the solutions in place to use it. CBRS operates in the 3.5 GHz band, which is spectrum traditionally used by the military and commercial satellite and ISP operators. That means in order to utilize the band, your network must employ a Spectrum Access System (SAS) to dynamically manage that spectrum use. In order to share spectrum with these other users, the SAS must access an Environmental Sensing Capability (ESC) network in order to comply with FCC regulations governing access priorities in areas of military operation. Additional network layers based on small cells would allow for increased capacity where needed the most. FWA at 3.5 GHz could deliver peak rates that few technologies could match without deep fixed fiber. With traffic increasingly concentrating indoors, small cells offer a potential solution to issues associated with legacy technologies (DAS, Wi-Fi). Local private network utilizing dedicated radio equipment to service a premise with specific applications and services. mMIMO hotspots would serve the needs of high usage, high density areas with relatively low mobility. Private LTE or 5G networks on 3.5 GHz could ensure the high reliability and low latency needs for robust IIoT operations. Emerging 5G RF technologies could enable a 3.5 GHz layer overlaid on the existing macro grid. Comsearch, a CommScope company, has been a leading innovator in spectrum management since 1977. Now, our newest SAS and ESC solutions can provide wireless operators access to CBRS and its precious capacity. When new spectrum opportunities come along—even those with strings attached—your network can count on CommScope and our Comsearch portfolio of spectrum management solutions to help your network achieve maximum efficiency and maximum regulatory compliance, in the CBRS band and beyond. 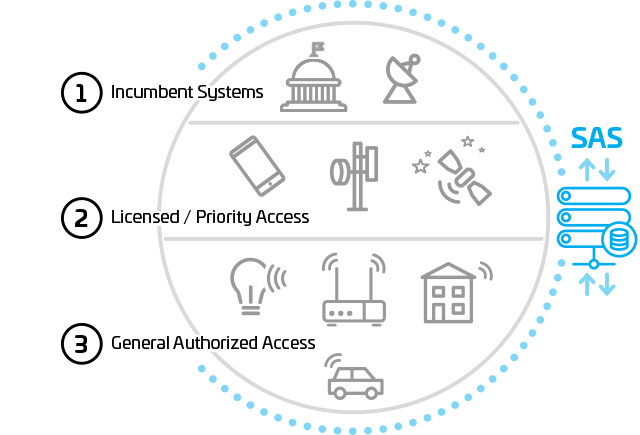 Our participation and leadership with the FCC and in the Wireless Innovation Forum and CBRS Alliance are helping to ensure successful development of rules, standards and recommendations for making the CBRS band a commercial success in the United States.